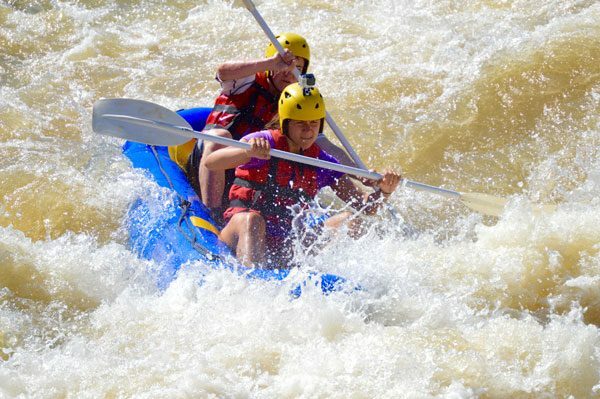 This is a two-day outing on two different parts of the Tugela River. Both classics! The first is a full-day outing above Spioenkop Dam and the second day below it. 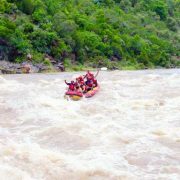 Although not on the sections of the Tugela River it is known for, this piece of river offers more than enough action for all levels of experience on white water. It is surprisingly big, fast, continuous and friendly (rapids from class 1 to 3+). You will be seeing parts of the Tugela few people do, and we intend to keep it that way. Another typical one-day section. Start just below the site where the voortrekkers first entered KwaZulu-Natal – Skietdrift. Steep, technical and high class (class 1-5). Itinerary rating: Moderate. Children younger than eight years of age will not be permitted to take part. Other information: No experience required and all you really need is to bring is your swim wear, as if you were going to the pool. All other information on specific requirements will be given before the trip. No off-road vehicles are needed. Depending on your choice of accommodation, we will recommend and coordinate travel and accommodation arrangements. Points of interest: Drakensberg Mountains, Bingelela overnight spot and restaurant, Tugela Rapids Lodge, Three Tree Hill Lodge, Rolling M Ranch, Tugela River Lodge, Spioenkop.